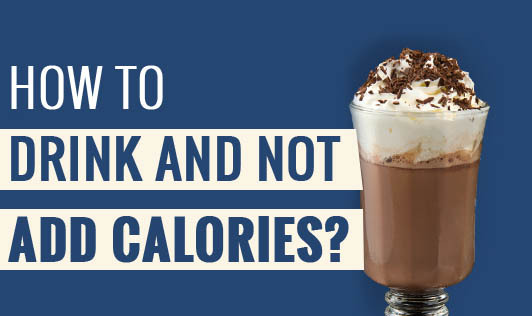 How to Drink and Not Add Calories?! • Choose your drink wisely: While you watch your calorie intake, you need not keep sipping fruit juices while you are at parties. Mind your portion control while you choose the right drink. Few good choices that are less than 100 calories are - a shot of white rum with soda, a single measure of whisky or brandy, a small glass of wine or champagne or a shot of gin with diet tonic. • Pace it up! : You can make a glass of wine last longer, by turning it into a spritzer by adding sparkling water or lemonade. Alternate your drink with mineral water or other soft drinks. • Prepare yourself: Be prepared to avoid bingeing along with your alcohol intake to cut down overall calorie intake. Stay nourished with a healthy breakfast and lunch. If you know that you won't be able to eat while you drink, have a small pre- drink meal or a snack ideally with a healthy fat to protect the lining of the stomach and slowdown absorption of alcohol into the system. A vegetable sandwich, a bowl of porridge or a cup of fruit yogurt are good options. • Only one at a time: Never let others top up your glass. Wait till you finish your whole glass before you get another. This will ensure that you know how much you are consuming during the course of your session. • The next Morning: The next morning, if you feel that you overshot your limit and are nursing a bad headache, then try for a lighter option of poached or scrambled eggs on a wheat bread. Eggs are rich in cysteine that breakdown chemicals stored in the liver after a night of drinking. poha, Yogurt or milk with fruits are healthier options to ease your discomfort.